14k Gold Viking ship pendant. Old world viking ship measures 20mm top to bottom by 18mm across. This gold pendant is a 3-d design and weighs about 4 grams. Great nautical pendant available in 14k yellow or white gold. 14K Gold fishing boat pendant, a Fishermans Favorite. This Golden Fishing Yacht is a Great pendant to wear to the Yacht Club or to dinner after a day out at sea. Measures 45mm across (50mm - 2 inches) weighs 6.8grams. Also available in a smaller 34mm across size. Available in 14k yellow or white gold. 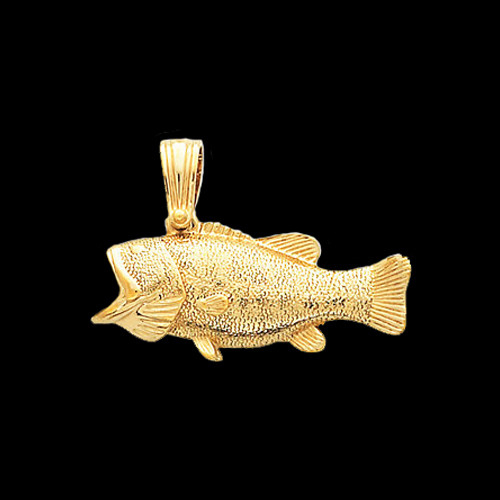 Beautiful 14k Yellow gold Big Bill fish pendant. This gold bill fish pendant measures 65mm from top to bottom by 70mm across. It weighs an incredible 20.1grams. Take your sport fishing passion to the next level with our Big Beautiful bill fish. Order in 14k Yellow or White gold. Big bold gold trophy fish. 14k yellow gold fish pendant is very detailed from his eye to the tip of his tail. Scales, fins, and gills all feature great detail. Fish pendant measures aprox. 52mm from top to bottom by 40mm across. Big gold fish weighs an incredible 16grams. This Big Bad Barracuda is fairly mild in 14k Gold. He measures 51mm from top to bottom (slightly more then 2 inches) and 41mm across. He features razor teeth and a very detailed body. Gram weight is 9.1grams. Incredible 14K Gold Cowboy Hat pendant. This Hat weighs 7.3grams and measures 46mm across (50mm - 2 inches) by 26mm long. Show your free western spirit and cowboy up with this beautiful pendant. 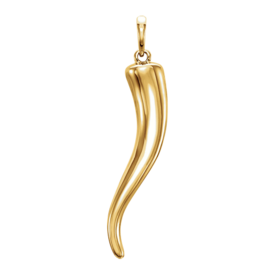 Beautiful 14k Gold Italian Horn pendant. 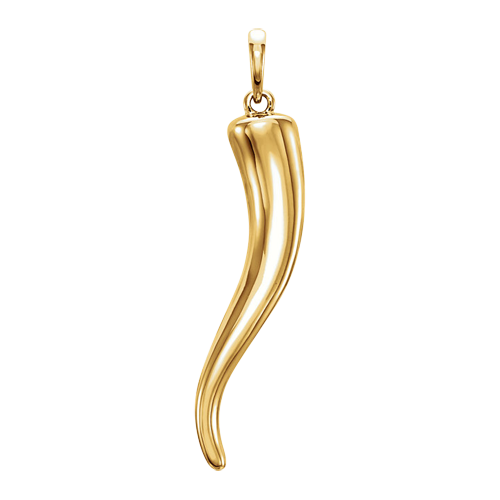 This Italian horn measures 31.75 mm in length and is available in 14k yellow, 14k white, 14k rose golds. Also available in Platinum. In 14k gold pendant weighs about 3.78 grams. This pendant is stocked in 14k yellow, other metals available by special order. Gold Cowboy hat charm pendant. Every Cowboys favorite accessory now look great around your neck. This Cowboy hat pendant measures 16mm across and weighs about 1.4grams. 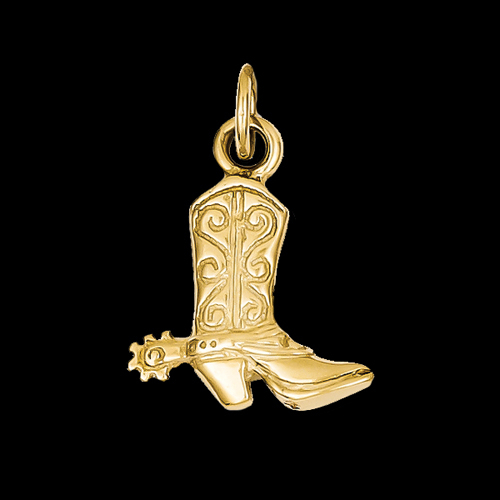 Adorable 14k yellow gold Cowboy boot pendant. This pendant is a 3-D design and measures 15mm before the simple ring bail. 14k White Gold Military symbol pendant. This pendant is available in 2 sizes, a 23mm in length 4.3gram size and a larger 34mm length 6.8gram size. Nice pendant. This 14K Gold Fish is Definitely a Keeper. No hook and release here!!! A Great Man's pendant of superior quality. This fish measures 17mm from top to bottom by 36mm from nose to tail. This Big Catch weighs 11.82grams. Handsome 14K Gold Trophy Fish measures aprox. 39mm (25mm - 1 inch) from the tip of the nose to the center of the tail and weighs 6.9grams. Order this great pendant in 14k yellow or white gold. Beautiful combination of polish and texture make this fish a keeper. 14K Gold Schooner Sailing ship. This Lovely ship weighs 5.7grams and measures about 32mm in length by 26mm top to bottom. A great sailing ship pendant available in 14k yellow or white gold. Gorgeous 14K Gold Prop Pendant. Pendant weighs 4.4grams and measures aprox. 27mm across. (25mm - 1inch) This propeller is available in 14k yellow or white gold. 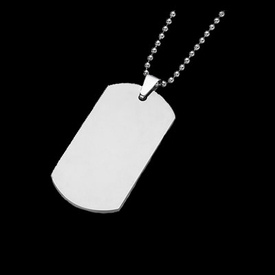 Tungsten polished dog tag necklace complete with a 24 inch bead chain. Necklace is secured with a lobster clasp.